Marquette Makes Huge 2nd Half Run But Falls Short ~ The Bucky Channel - The World of Sports from Wisconsin's Perspective. I, once again did not see one fraction of this game. Basically I'm not going to come on here and rehash some post game recap from ESPN when I cannot give my own emotion of feeling of the game. So I'll link the recap to ESPN and give a few thoughts. Post Game Recap of Villanova's 76-75 Victory. The problem with Marquette all year long was that if they are not hitting shots, they really struggle because they continue to shoot from long range until they bust the slump. Even with Dominic James this was the issue. Now when he is there he makes it that much harder to get into those slumps but it did happen. That leads to Marquette at times being very, very hot and very, very cold. Examples could be seen in the first half in which they missed plenty of shots and went in to the locker room down 16. 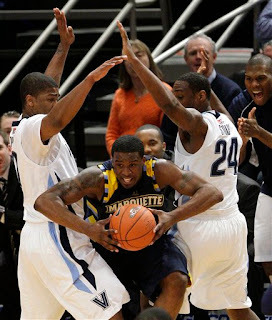 What Marquette's has for a strength though, is tenacious defense. It is a defense that really allows the Golden Eagles stay in virtually any game regardless the score. When you couple that with the ability to get hot from the field an what you get is Marquette phenomenal 2nd half which saw them score 44 to Villanova's 29. Unfortunately that left Marquette one point behind Villanova and sent the Golden Eagles home packing to await their seeding fate on Selection Sunday. Jimmy Butler was the scoring stud for MGE by scoring 19 off the bench from 13-16 shooting at the line. Wes Matthews was horrible from the field shooting 1-10 but managed 11 points and 10 rebounds. Lazar Hayward had 13 points and 11 rebounds. Acker and McNeal also scored in double digits getting 12 and 15 respectively. It's really unfortunate we do not get to see this Marquette team at full throttle during tourney time. I felt that when completely healthy, that even without the bigs they had the ability to get to the Final Four, especially with the lack of a dominate college team this year. Who is to say that won't happen though right? Other teams have gotten there with less on paper talent before. It all comes down to the pairings. We'll find out how Marquette's journey looks on Sunday.